The exclusively designed Barceló Old Town is in the heart of Prague, only 320 yards from Old Town Square. It features spacious, air-conditioned rooms and free Wi-Fi throughout the property. In a completely renovated 17th-century building, the Barceló Old Town Praha combines a historic façade with modern amenities like flat-screen TVs in all of the spacious rooms. Guests can relax by taking a bathtub or request a Thai massage in the privacy of their own room. The Bohemica Old Town Bar & Restaurant serves Czech and international cuisine, and the lobby bar has a wide selection of drinks, cocktails and aperitifs. A breakfast buffet is also available. Charles Bridge, the Jewish Quarter and Wenceslas Square can be reached within a 10-minute walk of the Barceló Old Town Hotel. The Namesti Republiky Metro Station is only 500 ft away. The first luxury Buddha-Bar Hotel in the world is in the vibrant heart of Prague, close to the Old Town Square and the fashionable Parizska shopping street. A spa center with a hot tub, a sauna and massages is available on site. The Buddha-Bar Hotel Prague restaurant offers an exquisite gourmet experience. Enjoy the ultimate in atmosphere, "eatertainment", highly personalized service and wonderful rooms, designed to meet the guests' highest expectations. Wireless internet is available in the entire hotel free of charge. Hotel Apartments Templova is situated in the heart of Prague, 300 metres from Old Town Square. The large apartments have a flat-screen satellite TV, free Wi-Fi and a DVD player. Each of the colourfully styled apartments features a separate kitchen including a microwave and a dishwasher. The Namesti Republiky Metro Stop is just 300 metres away from the Templova Apartments. Both Wenceslas Square and Charles Bridge can be reached within a 10-minute walk. A coffee and a bagel shop is located on the ground floor. The Sheraton Prague Charles Square Hotel occupies 4 adjoining historic buildings, 330 yards from Wenceslas Square and a 2 minute walk from Karlovo namesti Metro Station. It features an elegant restaurant, a fitness center, and a sauna. The Brasserie Delice serves fine French cuisine. Cocktails can be enjoyed in the Diamonds Bar, and the rooftop terrace High 8 offers views of Prague Castle. The spacious, elegantly furnished rooms at the Prague Charles Square Sheraton are air-conditioned. They feature a sitting area, a flat-screen satellite TV, a minibar, a free tea/coffee maker, and a bathroom with toiletries, a hairdryer, and bathrobes. Room service is available 24 hours. Wi-Fi is free in public areas, and there are computers with free internet access in the lobby. Located in the Prague|s Old Town in the Betlémské Square in a renovated historic building from the 14th century, a complex of apartments of various types Happy Prague Apartments has maintained the authenticity of its original character while offering modern amenities and service. All apartments are large, bright and elegantly furnished, featuring a fully equipped kitchens and free WiFi. The Charles Bridge is 400 metres from the property and the Old Town Square is a 7-minute walk away. Parking is possible on site. The Arbes hotel is located near the lush green Kinksy Gardens in central Prague, only a 5 minute walk from the Andel metro station. A tram stop can be found just around the corner. All rooms are elegantly equipped with new old-style furniture, a satellite TV and a minibar. A lockable private parking lot is available in the hotel courtyard. The lobby bar is open from 9am until 2am in the morning and offers a wide choice of alcohol and soft drinks. The cozy wine-cellar restaurant serves an extensive buffet breakfast as well as Czech and international cuisine for groups upon request. The wine cellar can also be used for meetings. The Hotel Arbes is conveniently located near Arbes square on the border between the Smichov (Prague 5) and Mala Strana (Prague one) districts, on the foot of Petrin hill and Prague Castle, close to the left bank of the Vltava river. The Hotel Kampa Garden is quietly located right in the historic heart of Prague on Kampa island, a favorite place of Prague residents for pleasant walks along the banks of the Vltava river. In the immediate vicinity of the hotel you can find various historic architectural jewels and the Charles Bridge. The guest accommodations of the Kampa Garden hotel are spacious and quiet. Most of the rooms have a nice view of the river, Charles Bridge or Prague Castle. Wireless internet access is available free of charge. The City Apartment provides luxurious and elegant accommodations in Prague's picturesque Lesser Town (Mala strana) and in the newly renovated Andel area of Prague. Guests can enjoy the free Wi-Fi. You are staying close to the historic center in a quiet location within easy walking distance from Charles Bridge, the big shopping centers and parks. Tram stops are reachable within a short walk from the City Apartments and parking is available right on the premises. You can enjoy plenty of space, absolute privacy and real home-like comfort - ideal also for long-term stays in the center of Prague. Maid service is provided once in 5 days. Daily cleaning is possible as well for an additional fee. In the quiet Vinohrady district, 330 yards from the Nám?stí Míru metro station, Hotel Orion features sauna facilities, serves free buffet breakfast, and provides apartments with a kitchenette and free Wi-Fi. Each unit comes with satellite TV and a safe, and includes a private bathroom with a shower or a bathtub. A hairdryer and free toiletries are provided as well. An internet workstation is available in the lobby. Snacks and souvenirs are sold at the front desk of the Orion Hotel. The large Havlickovy Sady park, various restaurants, bars and typical Prague beer pubs are located near the Hotel Orion. Wenceslas Square is half a mile from the hotel. Located in a quiet side street in the center of Prague, the newly refurbished Antik City Hotel is only a 7-minute walk from Wenceslas Square. It offers free internet access. The elegantly furnished rooms feature satellite TV, a minibar, a safe, and a bathroom with hairdryer. Most rooms are air-conditioned. A varied breakfast buffet is available each morning. The Antik City offers secure private parking and a 24-hour front desk. Karlovo namesti and I.P. Pavlova subway stations are 550 yards from the Antik City Hotel. The Št?pánská tram stop is just around the corner. Many shops and restaurants are nearby. In an impressive Baroque building below Prague Castle, this 4-star hotel offers panoramic views of the Old Town, Lessor Town and Prague Castle. 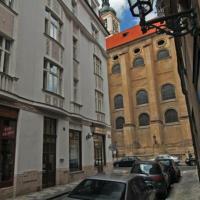 Old Town and Charles Bridge are within a 15 minute walk of the property. The Golden Star has a 270-year-old staircase and richly decorated ceilings. All rooms feature historic furniture and free wired internet. The restaurant features a historic vaulted ceiling and serves typical Czech dishes and international cuisine, as well as a daily breakfast buffet. A free internet terminal is available in the lobby. The rooms overlook the Lesser Town, the Royal Route, Prague Castle, or the Old Town. They feature hardwood floors, satellite TV, a minibar, and a bathroom with hairdryer. A limited number of parking spaces are available right in front of the hotel. The Raffaello hotel is located next to the I.P.Pavlova metro station, just 0.3 miles from the central Wenceslas Square. The elegant rooms come with satellite TV, minibar, marble bathrooms and they offer free Wi-Fi. Housed in a 19th-century building typical of Prague, the Raffaello's interior features crystal chandeliers, marble floors and elegant sofas. The trendy district of Vinohrady, renowned for its many bars and restaurants, is only 2 blocks away. Old Town Square as well as Charles Square are easy walking distance away. The Hotel Haštal Prague Old Town has a quiet location in the Old Town, a 15-minute walk from Charles Bridge and just a 5-minute walk from the Old Town Square. Guests receive a complimentary welcome drink. Wireless internet access is available throughout the entire hotel free of charge and you can borrow a laptop for free at the front desk. The Art-Nouveau restaurant serves fine Czech and international cuisine and the elegant bar serves aromatic coffee and a wide choice of cocktails. The Zen Asian Wellness center next door provides high-quality relaxation treatments by their certified staff from Asia. Attractive shopping areas like Na P?íkop? and Pa?ížská streets and the Palladium shopping center are situated in the immediate vicinity. The hotel owners support Unicef funds. Originally built in 1907, Park Inn Hotel is in Prague’s scenic second district, just a short distance from the Vltava River and Vysehrad Castle. Free Wi-Fi and a rooftop gym are available. The Park Inn’s exterior shows impressive Art Deco design, while the interior offers all modern comforts. All rooms feature individually adjustable air-conditioning and flat-screen satellite TVs. The rooftop fitness center at the Park Inn Hotel Prague can be used free of charge. All important sights can be easily reached by foot or by public transportation. The Albertov tram stop is only 100 yards away, and the Karlovo namesti metro station is a quarter mile away. Prague Main Train Station can be reached by tram in 15 minutes. A 10-minute walk from Prague's central Wenceslas Square and 165 ft from the I P Pavlova metro station, the City Central De Luxe features rooms with satellite TV, as well as free Wi-Fi in the lobby. In a nicely refurbished historic building, each room includes an electronic security lock system and a private bathroom. Wi-Fi in the rooms is available for an additional fee. All units are reachable by elevator. Limited public parking, which cannot be guaranteed in advance, is available on site and comes with an extra charge. Central Hotel Prague is close to Republic Square (Nám?stí Republiky) and near the Kotva department store and the Palladium shopping center, and features Wi-Fi throughout the entire building for free. The Old Town Square with the famous Astronomical Clock and the next metro station are only a 3-minute walk away. Wenceslas Square, Powder Tower as well as the fashionable Parizska street are also nearby. All rooms at the Central Hotel Prague come equipped with satellite TV and a safe. Each unit also includes a private bathroom provided with a hairdryer and free toiletries. Relax with a cup of coffee, tea or your favorite drink in the lobby bar, which has a large, flat-screen plasma TV and also serves cocktails. Set in the heart of Prague, Hotel Claris is only one metro (subway) stop from the famous Wenceslas Square. It offers free Wi-Fi and serves breakfast in a glass-roofed dining room. All quiet rooms provide a bathroom, TV and a hairdryer. The Namesti Miru metro stop is only 220 yards from Hotel Claris, the next tram stop is 55 yards away. The Rieger Park, featuring a famous beer garden with a beautiful view of Prague, can be found 220 yards from the Claris hotel. The Czech Inn occupies a beautifully restored 19th-century building one mile from the historic center of Prague, featuring stylish rooms, a great bar and free Wi-Fi in the lobby. The bar serves a breakfast buffet, drinks and light snacks. During the day and in the evenings, guests can enjoy 4 Czech beers on tap, a selection of absinthe and wine, and watch major sports events on TV. The staff will be happy to give directions to the main sights, but also recommends some lesser known places of interest. The Czech Inn offers a pick-up/drop-off service to/from the airport upon prior arrangement. Charges are applicable. The Namesti Miru metro station is only a short walk away. Trams and buses also stop nearby and take guests directly into the center of the city. Sights like Wenceslas Square and the Old Town Square can be easily reached by public transportation in 20 minutes. Located only 110 yards from the Delnicka tram station, Sir Toby’s is a 10-minute tram ride from the central Prague. It offers free Wi-Fi in the entire hotel. All rooms are individually furnished with Czech antiquities and provide a work desk. Most of the rooms also have a private bathroom. Guests can benefit of the common kitchen on the ground floor or enjoy the vegetarian food served in the traditional beer pub in the cellar of Sir Toby's. The Sir Toby's features 5 computers with internet access in the public areas, which guests can use free of charge. Sir Toby's offers an airport pick-up and drop-off service at an additional fee upon prior arrangement. Situated in the New Town, within walking distance of Prague's major sights, the Miss Sophie's neighborhood features a mix of traditional pubs and hip clubs. Miss Sophie's hotel offers modern design and personal service, a kitchen for the guests' use for those not staying in an apartment, and a 24-h reception. Wireless internet is available in the public areas of the hotel free of charge. Miss Sophie's offers a low-cost pick up/drop off service to/from the airport upon prior arrangement. Family-run Hotel U Páva, is in historic, central Prague, several meters from Charles Bridge and Kampa Island. It is a few minutes by foot from the castle and Old Town Square. This charming historic hotel offers rooms furnished with antique furniture, original paintings and uniquely styled suites with superb views, all featuring free Wi-Fi and air-conditioning. The daily, buffet breakfast is served in the cozy restaurant of the hotel. In the cellar there is a club bar with a sitting area and a wide range of Czech wines. Newly opened in September 2013, the Pentahotel Prague is within a 15-minute walk of the Old Town and Wenceslas Squares, and only 325 ft from the K?izíkova Metro Station, featuring a restaurant, a fitness center and stylish rooms with air conditioning. All rooms provide a 42-inch flat-screen TV with free movie channels, iPod docking station, coffee and tea-making facilities and a safe. The private bathroom has a rain-shower. Allergy-free bed linens are available upon request. Guests can start their day with a breakfast on-site, and the restaurant serves local and international cuisine, as well as a selection of international wines. In the lifestyle lobby, exotic cocktails can be enjoyed at the 24-hours bar. High-speed Wi-Fi can also be provided upon a charge, and pentahotel Prague has good public transportation services for reaching the lively center of the city, within a few minutes of the property. Located in Prague's Zizkov district, City Partner Hotel Gloria is a charming retreat amidst the quiet streets at the foot of the green Vitkov Hill, 1 km from the city centre. Wi-Fi is available at an additional charge. 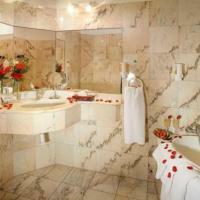 All tastefully furnished rooms of the Gloria hotel provide bathrooms with a tub and a shower. All rooms feature a minibar, a safety box and satellite TV. The reception is at your service 24 hours a day. A breakfast area, laundry and shuttle services as well as a tour desk are also available on site. The bus stop to the Old Town Square, reachable in a 12-minute ride, is directly in front of the hotel. The next tram stop is 300 metres away, and Wenceslas Square is a 10-minute ride away from there. Prague Castle, Charles Bridge and the National Museum can also be easily reached on foot from the City Partner Hotel Gloria. The Dorint Hotel Don Giovanni Prague is located next to the Zelivskeho Metro Station on line A, which takes you to the historic center in 5 minutes. It features a spa area and a restaurant offering a rich buffet breakfast. All of the elegantly furnished rooms are air-conditioned and feature a flat-screen satellite TV and a minibar. An breakfast buffet is offered every morning. The hotel restaurant offers Mediterranean cuisine and free cold starters. Amadeus, the hotel bar, serves freshly brewed coffee specialties, snacks, and Czech draft beers. The spa facilities of the Don Giovanni Dorint Prague can be used for an additional fee. This hotel is next to highway 1 and half a mile from the Chodov Shopping Center. It offers rooms with satellite TVs, an indoor pool and several tennis courts. You can reach the historic quarter of Prague by public transportation within 30 minutes from the Top Hotel Prague. The bus stop is located right in front of the building. Wellness and sports facilities include a gym, indoor and outdoor tennis courts, a steam bath and an indoor pool and are available against a surcharge. The Top Hotel's bowling alley is open until midnight. You can choose from 4 restaurants serving Czech and international cuisine, a traditional Czech beer pub, an atrium and a terrace. The Top Hotel Prague offers discounted rates if you stay 3 nights or more. Centrally located in the pedestrian area on Wenceslas Square, Ambassador Zlata Husa Hotel is surrounded by shops and is just 165 ft from Mustek Metro Station and a quarter mile from the Old Town Square. The spacious rooms at the Ambassador Zlata Husa are decorated in rich fabrics and include satellite TV and a sitting area. The marble bathrooms come with a spa tub and a separate shower. Guests at the Zlata Husa can enjoy delicious fish specialties at the Halali Restaurant, or visit the Plzenska rychta for traditional Czech beer and local dishes. For relaxation, the hotel features the Thai & Wellness Club, which specializes in relaxation baths, beauty wraps, Indian Ayurveda massages and Thai massages. The Ambassador is surrounded by local restaurants, cafés and bars. The National Museum is less than half a mile away. The Anna Hotel enjoys a quiet yet central location in the elegant Vinohrady quarter, 220 yards from Namesti Miru metro station. It features free Wi-Fi and an atrium. All rooms in the Hotel Anna have a private bathroom and satellite TV. There is also an internet station in the business center. Breakfast can bed enjoyed in the atrium or on the terrace. 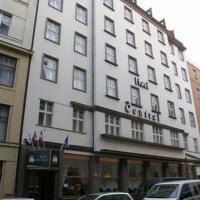 Prague's central Wenceslas Square can be reached within a 15-minute walk from the Hotel Anna. The large Riegrovy and Havlicoky parks are only 440 yards away. The hotel offers its own transportation service from an to Prague Airport and the Main Train Station. Close to the Vysehrad Castle and Vltava River, this 4-star hotel is only 2 metro (subway) stations from Prague's Wenceslas Square. Free internet access is provided in the lobby. Hotel Vysehrad is close to the Vysehrad Park which has open air cafes, offering splendid views of the city. The Vysehrad metro station is a 5-minute walk from the property. Guests can start their day with a rich buffet breakfast at the restaurant, where Czech and international cuisine is served. There is also a lobby bar serving various beverages. Hotel Vysehrad is 440 yards from the Congress Center. A shuttle service from Ruzyne Airport is offered. Moored on the Vltava River, Botel Racek is only a 10-minute tram ride from central Prague. It offers free private parking and free Wi-Fi in public areas. This boat hotel offers rooms with satellite TV and bathrooms with hairdryers. Ducks and swans can be seen from the windows. Botel Racek features a bar and a restaurant serving traditional Czech cuisine. Tram line no. 17 stops right outside Botel Racek. Public transport tickets are available at the reception. The center can also be reached in a 25-minute walk along the river. Vyšehrad Castle and a public swimming pool are close by the Racek Botel. This 4-star property is quietly only 300 ft from Vltava River and Karlovo namesti. It features air-conditioned rooms with free Wi-Fi, flat-screen TVs, fridges and tea/coffee makers. At the Best Western City Hotel Moran guests can start every day with a breakfast buffet including 6 different types of coffee. Numerous restaurants can be found on the streets surrounding the hotel. The Best Western Moran is 300 ft from the Karlovo namesti metro station and 200 ft from the Moran tram stop. Within 1 mile of the City Hotel Moran, guests can visit Charles Bridge and Wenceslas Square. The National Theater, the city's castle and the medieval town center are all a 10-minute drive away or less. The Botanical Gardens can be reached by car in 30 minutes. You can park your car in a garage across from the Hotel Moran for an additional fee. The Union hotel is located next to the old walls of the impressive Vysehrad Castle, close to the center of Prague and only a 5-minute walk from the Prague conference center. Built in Art Noveau style in the early 1900s, the hotel was last renovated in 2006. Most rooms have air conditioning and Wi-Fi is free in all rooms. It offers a restaurant serving Italian and international dishes. Guests can also enjoy national beers at the bar. There is also an internet cafe. Trams 18 and 24 offer access to the historic center within 10 minutes. Hotel Fortuna West is located in the western outskirts of Prague, 220 yards from a tram station leading into the center of the city. It offers a breakfast buffet and free Wi-Fi. All rooms provide a private bathroom and toilet, satellite TV and a work desk. Guests of the Fortuna West can enjoy Bohemian and international specialties in the on-site restaurant. The lobby bar serves cocktails and small snacks. Historic central Prague can be reached within a 20-minute tram ride from the Fortuna. It is also easily accessible from the Prague - Rozvadov highway, which is half a mile away. Prague International Airport is 4 miles away. The Andante Hotel is on a quiet street in the very center of Prague, just a few steps from Wenceslas Square and within walking distance of all major sights. This very-friendly hotel has 32 rooms (some of them with a balcony). Garages are available nearby for an additional fee. Wireless internet access is available for free in the entire hotel. Also a computer with internet access is available in the hotel lobby for free. Families are always welcome as well in the Andante hotel. Half a mile from Prague's Old Town Square and the Main Train Station, Best Western Bila Labut offers rooms with minibars, free Wi-Fi, satellite TV and work desks. There is a 24-hour front desk. 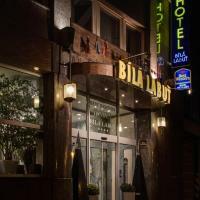 Bila Labut's restaurant offers an interesting menu featuring a great choice of Czech and international cuisine. The day and night bar is an inviting place to spend relaxing hours while sipping your favorite drink. The main shopping district with the Palladium Shopping Center and famous sights including Wenceslas Square can be easily accessed from the Best Western Bila. The metro station Namesti Republiky is 1700 ft away. A 15-minute walk from Charles Bridge, Hotel Julian occupies a neo-classical building in Prague’s Lesser Town. It offers free Wi-Fi and a secure parking lot in the courtyard. The modern rooms at the Julian all feature a minibar, a bathroom with hairdryer, satellite TV, and tea and coffee-making facilities. Most are air-conditioned. A rich breakfast buffet is served each morning (until 11 a.m. on weekends). Drinks are available in the lobby bar and in the in-house English-style pub, which also serves meals. The Julian’s gym is available free of charge. Guests can relax in the jacuzzi, by the open fireplace in the lobby, or on the summer terrace. Hotel Julian is fully wheelchair-accessible. The Svandovo divadlo tram stop is only a few steps away and provides direct services to the center of the city. The shopping and business complex Andel City is a short walk away and features 2 multiplex theaters and Prague’s largest shopping center. Hotel Waldstein is in the most attractive part of Prague, surrounded by Prague Castle and just a few steps from Charles Bridge and the Old Town Square. All the most important sights of Prague are easily accessible by foot. The nearest metro station is accessible a 5-minute walk away, and a tram stop within a 2-minute walk of the hotel. In a 14th-century building, rooms at Hotel Waldstein are equipped with antique furniture. Each room has a flat-screen satellite TV and free tea and coffee making facilities. 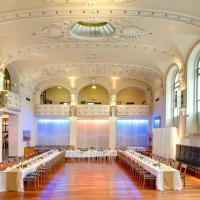 The hotel's rich, hot buffet breakfast is served in a beautiful vaulted Renaissance cellar. In summer, guests can relax in the pleasant atrium. Free Wi-Fi is provided in public areas. There is also a free internet point next to the 24-hour front desk. Bikes are also available for rent at the Waldstein. For trams 22, 23 and 12, guests can walk to Malostranske namesti tram station, only 165 ft away. The Malostranska Metro Station, on the A line, is 650 ft away. The Hotel Mira enjoys a quiet location in Prague, 3 tram stops from the I. P. Pavlova Metro Station and 5 stops from Wenceslas Square. Free Wi-Fi is available and public parking is free on the street. Each room comes with a minibar, satellite TV and a private bathroom with toiletries. All are accessible by elevator. A buffet breakfast can be enjoyed every morning at the Mira Hotel and the front desk is open 24 hours a day. The Hotel Denisa is 2 metro stops from Charles Bridge and the Old Town. The metro stop is just 650 ft away and Václav Havel Airport Prague is reachable within 10 minutes of the property. All the most important sights can be reached easily. The entire hotel was renovated in 2008 and has comfortably equipped rooms featuring modern furniture, flat-screen satellite TVs and tea and coffee-making facilities. There is an internet point in the lobby of the Denisa hotel available free of charge and wireless internet is available for free as well. Breakfast is included in the room price. Private parking is available in front of the Denisa hotel. Situated next to Prague´s Vystaviste convention center and the Tesla Arena sports hall, Expo Hotel offers rooms with minibars, satellite TV and free Wi-Fi. The nearest Vystaviste tram stop is 330 ft away and the Nadrazi Holesovice metro station is 1000 ft away. The hotel is only 10 minutes by public transportation from Wenceslas Square and the very heart of the historic Czech capital. Guests can also unwind in the recreational areas of Stromovka Park and Letna Hill. Guests can take advantage of the 24-hour front desk and tour and ticket services. A business center and currency exchange services are also available. Hotel Expo's restaurant serves traditional Czech specialties as well as international cuisine, accompanied by a wide selection of beverages including Moravian wines. In the summertime guests can enjoy their meals on the restaurant’s terrace. The charming, family-owned Andel hotel is conveniently located next to Prague's modern business and shopping centre Andel, 50 metres from the subway station. All rooms to the front side and on the top floor are fitted with double glazed windows. More than 100 TV and radio channels and of course free internet access throughout the entire building are at your disposal. In the morning the rich breakfast buffet, served under ancient vaults, provides you with energy to spend a great day in Prague. Coffee and various drinks are served in the vaulted cellar. The friendly multilingual reception team will provide you with any information you may need for an enjoyable time in Prague. 7 camera-protected parking spaces in front of Hotel Andel are available for free. In case the parking spaces are taken, further paid guarded parking lots are offered next to Hotel Andel. Hotel Andel can be easily reached by car and public transportation. The upscale Corinthia Hotel Prague stands on top of one of Prague's hills, 2 metro stops from the centre. It offers panoramic city views and a top-floor spa with a swimming pool. Free WiFi is available in the entire hotel. The Vysehrad metro station, the Prague Congress Centre and the 11th-century Vyšehrad fortress are a few steps from the Corinthia Hotel Prague. All rooms are air-conditioned and feature flat-screen satellite TVs, high-quality furniture and luxurious fabrics. Business and Executive Lounges offer lots of additional amenities. The Apollo Day Spa on the top floor offers a wide range of spa and fitness facilities and superb views. It is accessible at an additional cost when staying in a Superior Room. Czech, Mediterranean and Asian cuisine can be enjoyed in the various elegant restaurants of the Corinthia Hotel Prague. Only 650 ft from Pankrac Metro Station, the 4-star Panorama Hotel Prague features several sports and spa facilities, including a rooftop indoor pool, and panoramic views of the city. Wenceslas Square can be reached within 10 minutes by the metro. The air-conditioned rooms at Panorama Hotel Prague feature satellite TV, a minibar, and a bathroom with hairdryer. Free Wi-Fi is available throughout the hotel. The spa area at the Panorama includes a modern gym, a sauna, a steam bath and a hot tub. Extra charges may apply. The on-site restaurant Mezzo serves Czech and international dishes. Drinks and light meals can be enjoyed in the Panorama Hotel’s café, and a large breakfast buffet is available every morning. The popular Arcady Shopping Mall, featuring almost 150 shops, cafes and restaurants, is next door. The D1 highway is just 650 ft away, and central Prague is 4 subway stops away. Louren Hotel is a family-run 4-star hotel in a quiet street in the Vinohrady quarter, a 5-minute underground ride from Prague’s historic quarter. Free Wi-Fi is available in the entire hotel. Each room at Hotel Louren has a luxurious marble bathroom, a minibar, a safe, and individually adjustable air conditioning. The daily breakfast buffet includes homemade bread. Upon prior request, lunch and dinner with international cuisine can be served in the dining room. The Jiri z Podebrad subway station is less than 650 ft from Louren Hotel. Wenceslas Square is a 15-minute walk away. In a Baroque town house, Elite Hotel features rooms with antique furniture and hand-painted wooden ceilings. There is a courtyard terrace, and a spa with massages, a hot tub and sauna. The Elite is just a 10-minute walk from the Old Town Square, Wenceslas Square and Charles Bridge. Národní T?ída, on the B Metro Line, is 325 ft down the road. The air-conditioned rooms at the Elite are soundproof and include free Wi-Fi, a well stocked minibar, satellite TV and pay-per-view TV. The bathrooms have a hairdryer. The Ultramarin Restaurant serves authentic Thai dishes, and the Music Bar, in the vaulted cellars, has exotic cocktails and live jazz and Latin American music. The mood-lit lobby bar, which opens onto the courtyard terrace, features vaulted ceilings and leather armchairs. The 24-hour staff can arrange tickets to Prague State Opera and the National Theatre. Guests staying 3 nights or longer can enjoy special discounts at the spa. Located directly below Prague Castle, this 5-star boutique hotel is only a 10-minute walk from Charles Bridge. It offers a restaurant recommended by Michelin and air-conditioned accommodation with a flat-screen TV. Decorated with unique works of art by well-known Czech artists, the Hoffmeister & Spa offers individually designed rooms. Some have a hot tub. The units are located in several interconnected buildings. Hotel Hoffmeister’s spa facilities include a unique stone bath, a hot tub, and a sauna available in winter. Various massages and beauty treatments are on offer. Guests can enjoy Czech and international cuisine in the Café-Bar Ria and in the restaurant Ada. A wide range of fine wines is also available. In summer, guests can relax on the Hoffmeister’s terrace. The Hoffmeister & Spa has its own spacious underground car park. It is only 100 metres from the Malostranská underground station and the Old Castle Staircase.